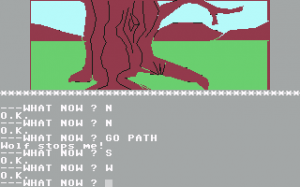 Venom is a text based adventure game with graphics. Many, many years ago the great Lord Mirosima defeated the evil Traklan and condemned him to spend eternity underground. Time passed and Traklan has arisen and once more threatens the land of Armosin. 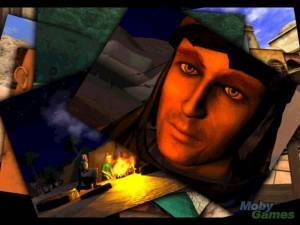 The player takes the role of Rikka, a warrior and friend of the current ruler, Arrel. 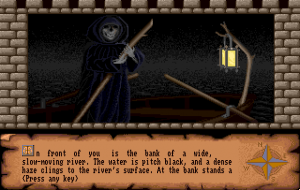 The game starts outside an inn, the Dancing Drayman, where Rikka has arranged to meet his friends Arrel and Beris, and unfolds as they explore the land. 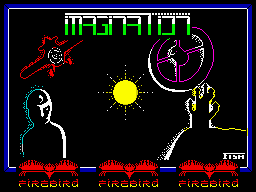 This game can be played either with the keyboard or by joystick. 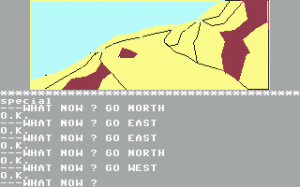 The commands needed to play the game, 'Go North', 'Examine', 'Give' etc are listed in a window on the right of the playing area. 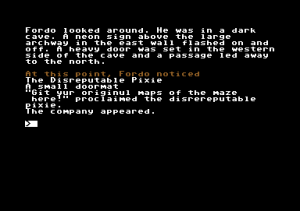 The player selects one by scrolling to it and the game then allows the player to select a suitable subject from either the inventory, the list of companions, or the text describing the current location.